Updating Your Yahoo Business Listing For Free! Long Point Digital grew up in the small town of Palisade, CO. As our company continued to grow, the limited real estate in the historic fruit and wine town became a struggle for us to find bigger office spaces. We needed more room to hire more rockstars, so we decided it was time for the city. We purchased an office space in Grand Junction, CO and started the move towards an even more successful digital marketing business. Prior to moving to our new office, we wanted to get a jump start on updating our online citations and directory listings. So we began the dig into the abyss of links. Many businesses do not know they should update their location on more than just their business cards and social media profiles. There are 100s of websites out there with your business address on it and it’s your job to make sure they’re right or hire a company like us to fix them. Otherwise, people who use these sites could be getting the wrong info! Updating, tracking, and keeping citations and directory listings up-to-date is a service we offer our clients within their SEO packages, so we knew our way around getting and updating the top listings. Even with our well-versed skill in building listings, there is one roadblock many business owners and other digital marketing companies run into and its name is Yext. Yext is a company that has spent the last few years accumulating online directories by teaming up with them and placing them within a Yext subscription in order to update it. If you’re willing to spend a pretty penny monthly or annually, you can easily update quite a few of your directory listings. However, if you’re just wanting to update your listings without the added subscriptions, sometimes you can find a workaround and Yext does not make it an easy to find process. Yext Controls Yahoo’s Business Listings? Yahoo was one of the first popular search engines on the internet. Over the years it has been surpassed by search engines like Google and Bing. Even though its popularity dwindled over the years, it is still a good idea to keep your Yahoo listing up-to-date, because there are people who prefer to use Yahoo and they could turn into customers! If you’ve tried updating your Yahoo listing recently, then you’ve probably run into the Yext roadblock and trying to continue your update becomes a confusing process with fees. Below we’ll take you through the steps on how to update your Yahoo listing for free and avoid Yext’s fees altogether. You’ll notice once you go to Yahoo Local, it no longer exists and you will be redirected to the main search engine landing page of Yahoo. No problem, using the search bar, search your business name. After you’ve clicked “local,” you’ll be brought to your business listing. You should see a “Verify Your Listing” link on your listing. Click this link and you will notice you’ve been redirected to Yext. Uhoh! No worries. Let’s go through the free steps. Yext scans multiple directories and citation listings and will show you which business listings are correct and which need to be updated. It should be stated that these are not listings that Yext controls or owns. Most of your business listings can be manually updated without Yext. At the top, you will notice a blue button that reads something along the lines of “Fix All Errors.” Press this blue button. After you’ve pressed the fix all errors button, you’ll be brought to a form and asked to fill out your business information with the info you want for your business. Fill in the form and press continue. Here is where Yext tries to get tricky. Once you press continue, you will see all the Yext subscriptions. You will see that the Yahoo subscription as well, ignore this. To get your business listing updated for free, scroll down under the subscriptions table. Right under the table, you will see an almost hidden link to continue claiming your yahoo business update/claim. When you press the almost hidden link, you will now see the price is $0.00 to update just your Yahoo listing. Fill out the form scroll to the bottom and place your order. After you’ve placed your order for a Yahoo listing, look for an email from Yext to confirm your update/claim to the business. They will send an email to the email you used as the main contact while filling out the form. After you’ve confirmed, that’s it, you’re done! If you do not see your Yahoo listing address update right away, don’t worry. Sometimes it could take a couple of days or a couple of weeks, just make a note to check on it later. 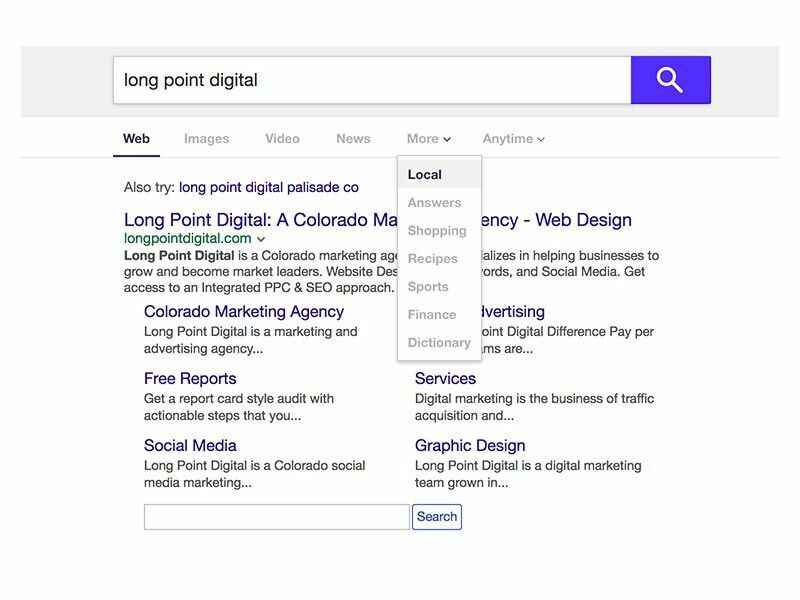 If you find that updating and maintaining all your citations listings is becoming a hassle and getting in the way of production for your business, give Long Point Digital a call and we can assist with your SEO needs. Share this to get the word out!